IMPROVEMENTS to road safety have been made at Downe Retail Park. Councillor Gareth Sharvin has welcomed the co-operation and work carried out by the property owner of Downe Retail Park, Mr John Miskelly, after consultation to resolving the road safety and congestion issues that existed at Retail Park. 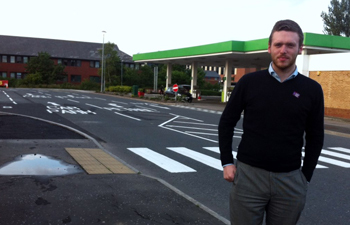 Councillor Gareth Sharvin looks over the improvements to road safety at the Downe Retail Park. Councillor Sharvin said: “ I have received a large number of calls from members of the public about the state of road markings at Downe Retail Park and they have asked for urgent action to implement the road improvements. There has been a number of near misses and young children are often visiting the facilities after playing football at Dunleath. Safety is for all road users and pedestrians is paramount. “The Downe Retail Park hosts a number of tenants including ASDA, McDonalds and Argos. The retail park sees a high volume of shoppers every week and the volume of traffic reflects the need for an improved traffic management system throughout the retail park. I have approached the store managers within the retail park to seek their issues and concerns around the road conditions at the retail park. After consultation with both business owners and residents, I organised a number of discussions with the Retail Park owner Mr John Miskelly. “Mr Miskelly has understood the issues which were highlighted and expressed his commitment to ensuring the safety of all visitors to the retail park. Downe Retail Park has already had a number of improvements such as a new lane way assisting traffic flow into the retail park, improvements to the pedestrian crossing and all road markings have been remarked for improved visibility. “With all these improvements now in place, visitors to Downe Retail Park can enjoy their shopping in a safe environment. I would like to thank the owner and stores in their co-operation, support and commitment for the safety of all shoppers. This is another success for road safety in Down District,” added Councillor Sharvin.